Location. 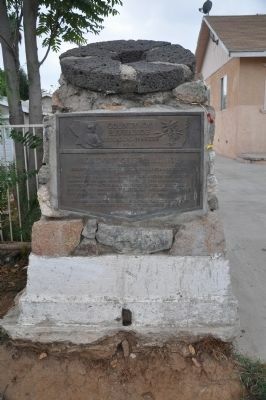 33° 59.715′ N, 117° 24.395′ W. Marker is in Rubidoux, California, in Riverside County. Marker is at the intersection of Molino Way and Fort Drive, on the right when traveling east on Molino Way. Touch for map. 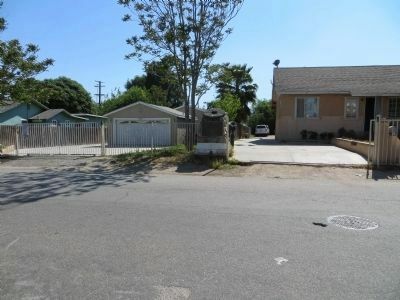 Marker is at or near this postal address: 5540 Molino Way, Riverside CA 92509, United States of America. Touch for directions. (approx. 2.4 miles away); The First Marsh Grapefruit Trees into California (approx. 3.4 miles away); Parent Washington Navel Orange Tree (approx. 3.4 miles away); Agua Mansa Cemetery (approx. 3.9 miles away); Highgrove Hydroelectric Plant (approx. 4 miles away). Louis Robidoux had been a mountain man in the southwest before coming to California. He became one of the most prominent cattle ranchers in southern California as well as a local judge and Supervisor. Pieces claimed to be from the grist mill are built into the rock monument that holds the bronze plaque. Fort Drive is named for a small military post temporarily located here from 1852-1854. — Submitted December 30, 2011. More. 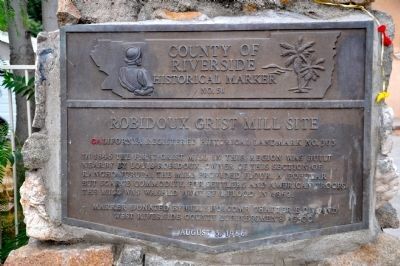 Search the internet for Robidoux Grist Mill Site. Credits. This page was last revised on June 16, 2016. This page originally submitted on December 18, 2011, by Michael Kindig of Long Beach, California. This page has been viewed 619 times since then and 5 times this year. Photos: 1, 2. submitted on December 18, 2011, by Michael Kindig of Long Beach, California. 3. submitted on April 4, 2015, by Bill Kirchner of Tucson, Arizona. • Syd Whittle was the editor who published this page.